"Aren't I Handsome?" Hansen conveniently mispronounces his name, and yes, this little leopard is very handsome indeed. He has a pudgy tummy and adorable feet with brown felt pawpads. 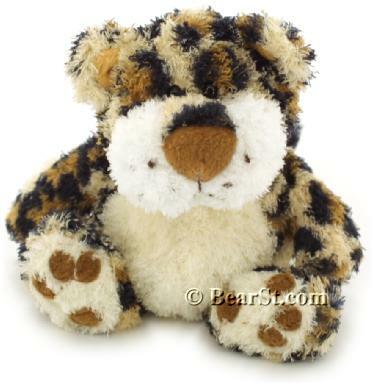 He is a member of the Bean Bag Buddies Collection, and is 5" tall, great as a travelling companion. Copyright © Bear St. 1995-2018, All Rights Reserved. No part of this HTML nor graphic images may be utilized, reproduced, stored in a retrieval system, or transmitted in any form or by any means -- electronic, mechanical, photocopying, recording or otherwise -- without the written permission of the copyright owner. All copyright graphics are marked for easy identification using visible and invisible digital watermarks. Any use of these graphics are strictly prohibited by law. Thank you for visiting the Bear St. and the Wide Wild World of GUND. Kosen studio-haus, creations of distinction. Animals Animals, and the Great Steiff Collection.